BACKGROUND: Undifferentiated embryonal sarcoma of the liver (UESL) is a rare neoplasm, and the third-most common paediatric hepatic malignaney. However, no treatment guidelines exist. No randomised, eontrolled trials support speeifie eombinations of therapy. OBJECTIVE: To compare presentation and management of UESL with other series, review the literature, and formulate treatment guidelines. METHODS: A retrospective chart review of all hepatic malignancies was conducted from 1996 to 2007 and 5 children with UESL were identified. Management and outcomes were documented. The literature regarding treatment modalities up to September 2012 was reviewed. Results. Over a period of 11 years, 5 patients presented. All underwent surgery and 4 received chemotherapy. One received radiotherapy at relapse. Three are disease-free with follow-up of 58 - 184 months. One died after relapse, as did the patient whose family declined chemotherapy. CONCLUSION: The improved outcomes are consistent with the international experience and are probably related to combined treatment modalities and advances in supportive care. Pre-operative percutaneous biopsy provides no benefit if the lesion is resectable because it may not prove to be diagnostic, and may cause recurrence in the biopsy tract. If resectable, the recommended treatment is primary excision and adjuvant chemotherapy, with radiotherapy in selected cases. If unresectable, open biopsy is necessary to document histology, and neoadjuvant chemotherapy is given prior to resection. If deemed unresectable, liver transplantation is considered. 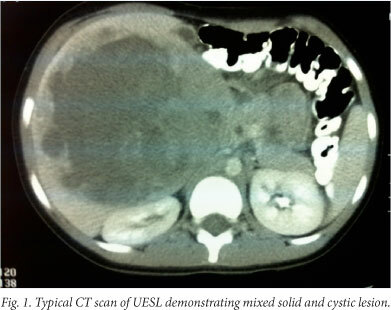 Undifferentiated embryonal sarcoma of the liver (UESL) is a rare hepatic neoplasm that occurs mainly in children. After hepatoblastoma (HB) and hepatocellular carcinoma (HCC), it is the third most common malignant liver tumour in children. Most are diagnosed in the 6 - 10-year age group, with 88% of patients diagnosed before the age of 15 years. This falls between the peak ages of incidence for HB (<2 years) and HCC (>10 years). Although there are diagnostic criteria on clinical, radiological and histological grounds,[3-5] there is no treatment consensus. Early literature reports a poor prognosis with limited survival, and long-term survival rates are difficult to assess due to relatively short follow-up. Subsequent reports suggest significantly improved prognosis with the use of multimodal therapy,[6-8] which may be secondary to one of many factors. Some units favour a sequence of neo-adjuvant chemotherapy, followed by surgery and adjuvant chemotherapy. Others prefer surgery followed by chemotherapy. Radiation has an uncertain role and the optimal dose has yet to be established. To determine the optimal course of therapy the 5 cases reported here are compared with documented series, to determine whether there are major differences in presentation, treatment and outcomes, alongside a review of the literature. After institutional ethical approval, case records of all hepatic malignancies treated between July 1996 and December 2007 were retrospectively reviewed. Five patients with histologically proven UESL presented to the paediatric oncology unit. This state-funded unit provides specialist care to all requiring it, irrespective of their ability to pay. Particular reference was made to mode and duration of presenting symptoms, imaging studies, treatment modalities and outcomes. An English language Pubmed search, limited to paediatric patients, was performed retrospectively from 2012, using the search criteria 'undifferentiated sarcoma of the liver' and 'malignant mesenchymoma'. Publications containing details of surgical procedures and chemotherapy regimens were included, which were composed mainly of retrospective reviews. They were critically assessed to elucidate trends, particularly a relationship between clear surgical margins and improved survival, and the efficacy of particular chemotherapy protocols. Five patients - 4 females and 1 male, ranging in age from 5 years to11 years - were diagnosed with UESL. Follow-up ranged in duration from 58 months to 15 years. Two have subsequently died: the first child was operated on but the family elected not to utilise chemotherapy for religious reasons; the second achieved short-term remission but died from recurrence 12 months after diagnosis. All patients presented with a short duration of abdominal symptoms, including pain, discomfort and distension. All had normal α-fetoprotein levels. None had metastatic disease at the time of diagnosis. One patient with an apparently irresectable tumour received neo-adjuvant chemotherapy prior to resection; the remaining 4 underwent primary surgical excision, followed by chemotherapy. Of these 4 patients, microscopically clear margins were achieved in 3. Two had intra-operative spillage of tumour. One suffered spontaneous rupture of the tumour and received brachytherapy when he presented with recurrent disease. All tumours were right-sided, necessitating either right- or extended right hepatectomy. There was no significant post-operative morbidity. Patients presented similarly to other documented cases. There was no unusual delay in presentation, and patients were managed according to available protocols. Willis first described the pathology of UESL in 1962, classifying it as a rhabdomyoblastic mixed tumour. In 1973 Stanley classified it as a malignant mesenchymoma because of the presence of focal chondroid-appearing cells. Stocker and Ishak definitively described the pathology and adopted the term 'undifferentiated (embryonal) sarcoma of the liver'. Many case reports and case series have detailed various combinations of treatment modalities, but only two report patients with UESL prospectively entered into a clinical trial. [13,14] Overall survival rates are difficult to assess, as few reports document long term follow-up. Early literature reports a poor prognosis with limited survival. Stocker and Ishak report an 80% mortality rate in a median period of 11 months. Subsequent articles suggest that the use of multimodal therapy has significantly improved prognosis. [6-8] This improvement in outcome may be related to a modern multidisciplinary approach, including potent combinations of neo- adjuvant and adjuvant chemotherapy, radical surgical resection and radiotherapy, and improved supportive care. Primary surgical resection remains the diagnostic and therapeutic procedure of choice. However, in patients where UESL is suspected, and resection is deemed unfeasible on imaging, histological confirmation is mandatory. This is because neo-adjuvant protocols differ from those used to treat HB and HCC. Although UESL can be successfully diagnosed using fine-needle aspiration and percutaneous biopsy, there is a theoretically higher risk of peritoneal and tract seeding. Due to the predominantly cystic nature of UESL, percutaneous biopsy also may not provide representative tissue and an open biopsy is preferred. Biopsy is, however, not routine in the work up of HB and HCC, although it is used where there is diagnostic doubt since HB may present similarly to UESL and have low α-fetoprotein levels. Patients with UESL cannot be cured using modalities that exclude surgery. Where the lesion is deemed resectable on available radiology, the ideal approach is primary exploration with a view to complete resection and subsequent adjuvant therapy. Steiner et al. describe second-look laparotomy with biopsy of the tumour bed after initial resection and adjuvant chemotherapy to assess response. Diagnostic radiology improvements render this approach obsolete, and the second-look laparotomy may expose the patient to unnecessary surgery with potential morbidity and mortality. The sequence of open biopsy, neo-adjuvant chemotherapy, repeat imaging, surgical excision, and adjuvant chemotherapy has markedly reduced tumour size in some cases, with complete resection being achieved in cases that previously could not be adequately surgically excised. [7-20] Liver transplantation has been performed for non- resectable tumours, or for recurrent disease after previous resection, and has been suggested to offer more likelihood of cure than adding radiation. Five such patients have been documented with claimed disease-free survival from 18 months to 5 years. [21-24] This encouraging therapeutic option must be thoroughly evaluated with larger numbers of subjects before more valid conclusions can be drawn, particularly as it has been suggested that poor outcomes in patients with malignancies do not justify the use of scarce organs for transplantation. Sarcoma and hepatoblastoma chemotherapy protocols appear to demonstrate the greatest efficacy in UESL. Because there were no standard treatment guidelines, the Italian (GCI) and German (CWS) Soft Tissue Sarcoma Cooperative Study Groups independently treated children with UESL according to the childhood rhabdomyosarcoma guidelines. Seventeen patients were prospectively enrolled in studies between 1979 and 1995. They were treated using the same multimodal therapy approach as for patients with sarcomas, namely conservative surgery at diagnosis, multiagent chemotherapy, and second-look operation in cases of residual disease. Of these tumours 62% showed reduction in volume following chemotherapy. There are more data on the treatment of patients with sarcoma protocols[7,8,13,14,26,27] than those with hepatoblastoma protocols. [17-19,30,31] Such reports do not lend themselves to rigorous statistical analysis, but the relatively high survival rate in patients treated on sarcoma protocols implies acceptable efficacy. Since the camptothecin analogues irinotecan and topotecan are promising new agents in treating rhabdomyosarcoma, they may prove to be of use in treating UESL. An article on UESL from a developing country details the successful treatment of 3 patients with cisplatinum, bleomycin and etoposide, a course of treatment which may have been chosen for its comparatively low cost, despite the incidence of pulmonary fibrosis which limits use of bleomycin in better-resourced centres. All 3 patients were alive at the time of publication, lending support to the use of these drugs in developing countries. Agents such as paclitaxel, vinorelbine and gemcitabine all offer hope of future treatment options. Oxaliplatin is a newer platinum agent with a more favourable toxicity profile, which is being considered as a possible agent against recurrent hepatoblastoma, and may thus also offer hope in the treatment of UESL. Neither radiotherapy alone, nor the combination of surgery and radiation without chemotherapy, improves survival in UESL. While radiotherapy is not part of the standard treatment protocol for other hepatic malignancies (because the effective tumour dose exceeds hepatic tolerance), a role for it may evolve in the treatment of UESL as soft-tissue sarcomas are typically radiosensitive. Thus, due to the high incidence of local recurrence, radiotherapy may be justified as an adjunct to surgery and chemotherapy. [14,17,19,27,28,32,33] Neo-adjuvant chemoradiation has also been used to reduce tumour size, leading to total resection. Based on largely anecdotal evidence, radiotherapy is reserved for high-risk patients, including those in whom tumour spillage or rupture has occurred or in whom surgical margins are positive. Protocols tend to be individualised, based on the treating facility's local experience. While the lowest effective radiation dose has yet to be defined, soft tissue sarcomas require doses greater than 50 Gray (Gy). Doses given with apparent success in UESL range from 20 to 40 Gy. The tolerance of more than 50% of the liver is limited to 30 Gy (34). As the liver moves with respiration, image-guided radiotherapy may improve the ability to treat without exceeding hepatic tolerance. Local recurrence and metastatic disease remain the major impediments to long-term, disease-free survival. Due to the rarity of UESL, there are minimal data on which to judge the effectiveness of newer therapies, including radiotherapy and chemotherapy. Further questions to be explored include the possible role of stem cell transplants, and which agents should be used as second-line treatment in cases of relapse. Liver transplantation is a final treatment option in patients with unresectable tumours. In under-resourced developing countries, this route cannot be recommended as routine, due to organ scarcity and prohibitively high costs. Prognosis in UESL has improved dramatically with the aggressive use of multimodal therapy. 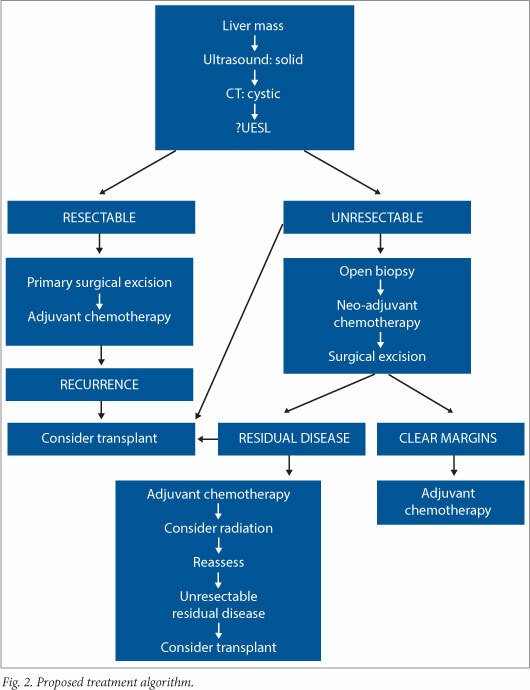 Should the lesion initially be deemed resectable, primary surgical excision to ensure decreased tumour burden before chemotherapy will achieve optimal results. The recommendation is that an open biopsy should be performed when imaging predicts an incomplete excision, followed by neo-adjuvant chemotherapy, repeat imaging, surgical excision, and adjuvant chemotherapy. The small numbers of patients with this condition preclude randomised controlled trials. Guidelines such as these are offered to clinicians to guide their decisions for treatment of this rare childhood tumour.